Local Businesses and Organizations have contributed to the success of OCHFH. To date, Schneider Electric has sponsored six homes in Oconee County. 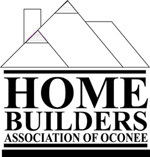 The Home Builders Association of Oconee (HBA) built three Habitat houses: two in Seneca and one in Fair Play. The Western Upstate of Association of Realtors contributed a $5,000 grant from the South Carolina Realtors Housing Opportunity Committee and volunteer labor toward the construction of the HBA home in Fair Play. Foothills Church has sponsored and provided work crews for a home at 928 Jaymory Way, Seneca. Community Bank, Bank of America, and Wells Fargo have all made substantial grants to OCHFH. A business in the construction industry may be able to offer plumbing, heating, electrical or building materials, supplies or services. A builder may give the gift of time by volunteering one day or many as a crew leader. One of the greatest needs on the construction site is persons of skill who are willing to teach and lead 4-6 unskilled volunteers in a specific task. A business not in the construction industry may be able to assist Habitat with more than funds by stocking some office supplies, preparing and serving meals for construction volunteers, including Habitat info in customer mailings, and providing volunteers for special events.